What's more fun than running as fast as you can and then getting jerked backward so quickly that you find yourself lying on your back? Nothing! 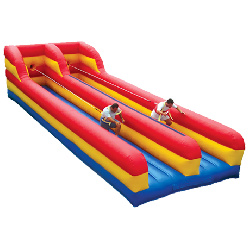 Our Bungee Run inflatable is proof of that. You can even compete against your best friend or worst enemy at the same time. Two kids can play at a time on this inflatable. The Bungee Run also comes with two batons that can be attached to the side of the unit showing how far you were able to stretch the bungee cord. Sometimes the bigger kids find it simple to get to the end of the baton markers. Don't worry, our operators have found many fun variations to keep them busy with. One of our favorites is to see who can get to the end and back to the starting wall first. Head to head competition, who can go the distance! Participants must be at least 48″ tall. Big and little kids pull a padded harness over their head and tighten it up. They grab their baton and wait for the signal to run – bungee run that is! The Bungee Run can be rough on your body depending on how wild you get. It’s always up to the kids to determine how rough they want to be. The further they stretch the bungee cord, the harder it snaps them back onto the inflatable. As always, our operators are there to make sure everyone is completely safe, so you have nothing to worry about.